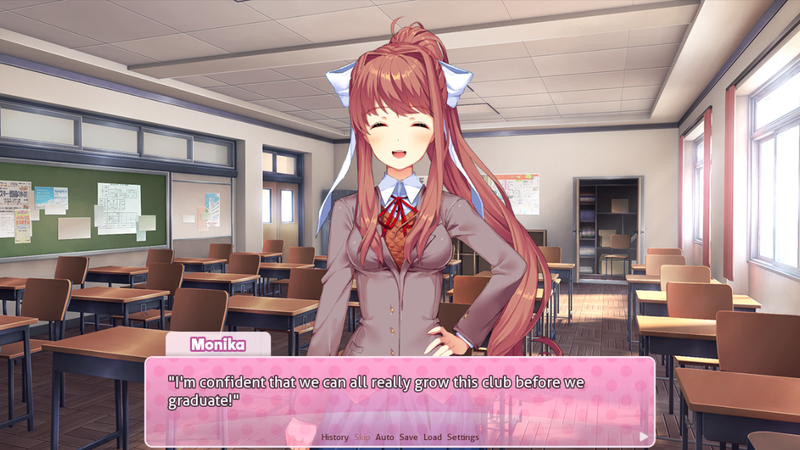 Doki Doki Literature Club is a free visual novel that presents itself as a totally normal game, where you’ll meet some cute girls at an after school club. There’s more than meets the eye to this one, though. When I saw a few weeks ago that Doki Doki Literature Club was one of the most popular visual novels on itch.io, I was surprised. While it didn’t look bad it just seemed so… generic. Cute moe girls! After school clubs! These were the kinds of visual novels that I stray away from. Last night, as I played Doki Doki Literature Club, I found myself not just utterly baffled but at times truly distressed. This game plays on your expectations of a cute anime girl visual novel, with its cutesy girls next door, and finds ways to twist them that hurt. It’s impossible for me to try to just tell you not to get invested in any of the characters because they are insidiously charming… until they’re not. This game is probably best experienced if you go in blind, but if you aren’t sold yet, here’s a taste of what to expect. There are small hints of the game’s disturbing nature early on. The characters’ poetry that you read deals with more serious ideas and feelings. The plucky girl next door writes about putting her happy feelings in a jar and then smashing them, the shy girl about obsession and death, and the cute but mean one writes about the futility of choice. The dialogue for these characters was also a little ironic, and at times, just plain sad. This is a truly special game. Any small complaints I may have (it is sometimes gratuitously violent) are overshadowed by the ways it is successfully messed with my head. If you like horror games, especially ones that really get under your skin, please check out Doki Doki Literature Club.